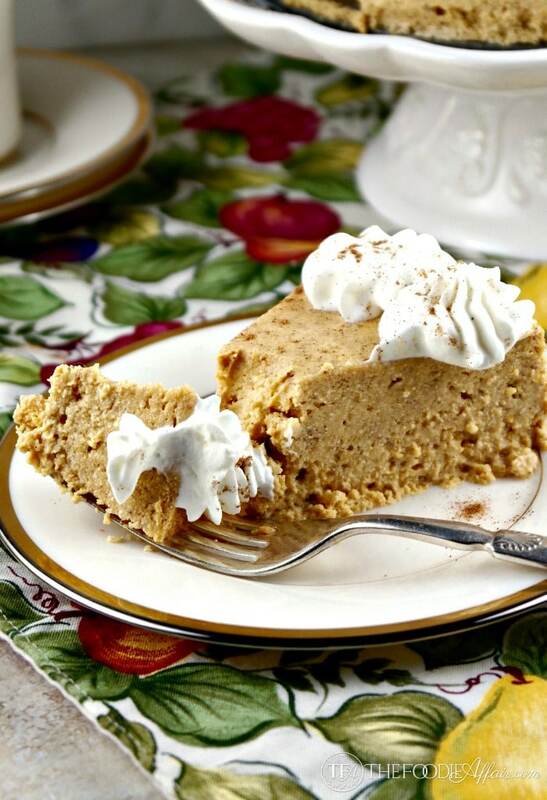 Low carb pumpkin cheesecake made with homemade pumpkin pie spices, pumpkin puree and ricotta cheese! With approximately 6 carbs per slice this cheesecake will be your favorite holiday dessert! I’m behind on my recipe sharing this week, but weeks ahead of holiday baking! Today I’m sharing a dessert that will leave you craving for cool evenings, falling leaves, and warm blankets! You know that saying, right? Well, the CAN’T really applies when you are trying to follow a low carb diet because just about every delicious holiday dessert is made with lots of carb-y sugar and flour, but guess what? I’ve found a way to enjoy a favorite holiday treat that is low in sugar, gluten-free and only has about 6 carbs per slice! 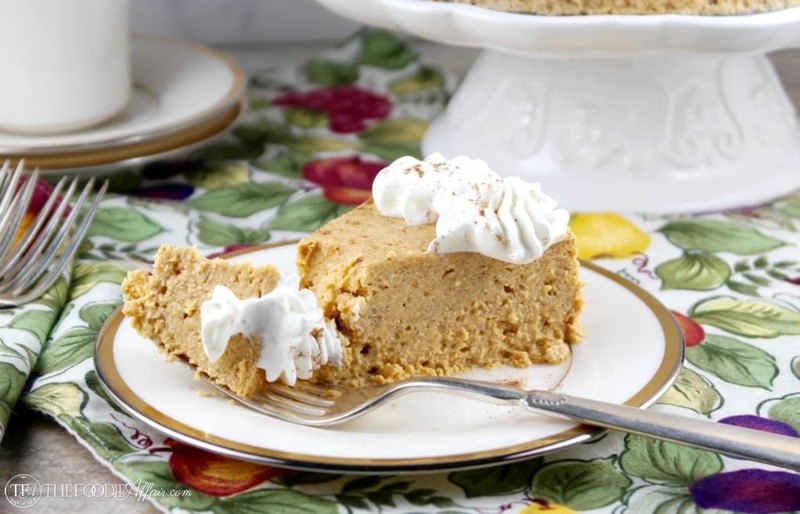 If you haven’t made a batch of homemade pumpkin pie spices then go do that right away. Not only is mixing your own seasonal spices together economical, but you won’t have to hunt it down in the grocery store ever again. Plus, having it on hand saves you time! You will only need to open one spice jar instead of 5 when enhancing pumpkin-y flavors. One easy way to modify a traditional cheesecake recipe to a lower carb dessert is to make it without a crust. I promise that for a dessert like this, you won’t miss the crust. It’s satisfying without it and saves you a few extra calories too. I propose adding more fresh whipped cream to your slice instead! Surprisingly, also used in this recipe is whole fat ricotta instead of the more common cream cheese. Both give you a creamy base, but the ricotta has less calories. So how can I add such rich and delicious flavor and still keep this treat low carb? Did you know that the low-fat version of most ingredients has more carbs then their whole fat counterpart? It’s true! It’s not a huge amount (source), but when you are trying to keep a low carbohydrate count every gram can add up quickly and make a difference! You also might want to try making your own vanilla extract! It’s super easy to make and so handy to have during the holidays. Need a dessert to share at a potluck? 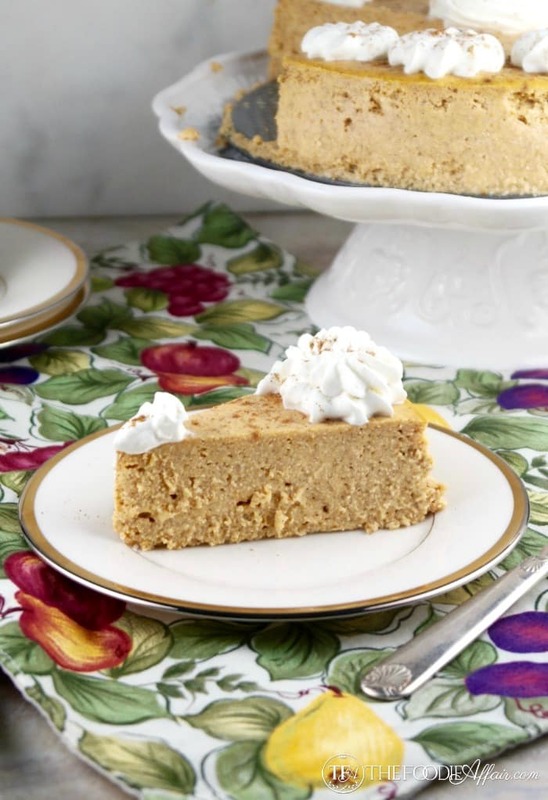 Try these Pumpkin Cheesecake Bars! Not low carb, but one of Alan’s favorite desserts that I make every year! 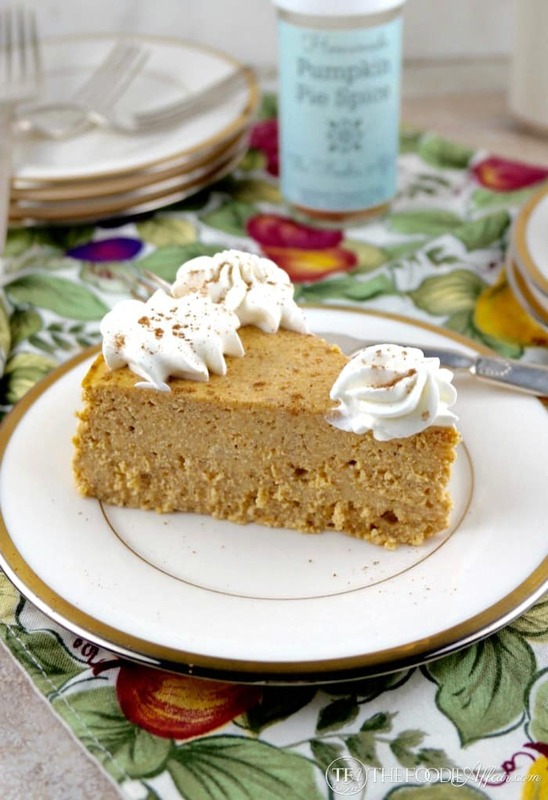 Creamy and delicious pumpkin cheesecake made without a crust. You won't miss the extra carbs, promise! Grease the sites and bottom of an 8 inch springform pan with butter. Cover bottom with foil half way up the pan making sure no water (adding to the pan when baking) or any part is open or exposed. Set aside. In a medium bowl whisk together flours, pumpkin pie spice, salt and set aside. In a large bowl blend ricotta and pumpkin puree until well combined. Add sugar. Add eggs whisking in one at a time. Mix in the remaining prepared dry ingredients, and then fold in the vanilla. Place pan in the middle of a baking pan with a 1 inch lip. Add warm water to the pan util the water reaches about 1/2 inch up the springform pan. Bake for about 1 hour and 15 minutes or until the center is firm (not jiggly). Remove from the oven and cool for 30 minutes. Refrigerate. Serve with WHIPPED CREAM: In a deep bowl mix cream, sugar and vanilla with a hand blende for 2 minutes or until until desired consistency. Pour batter into the prepared springform pan. I can’t believe how healthy this cheesecake is…and no carbs? I can’t wait to try it. This sounds delicious! Love that it’s low carb too. I’m going to have to try this once fall sets in here. This is the first pumpkin post I have seen and I am so excited (I am so over summer). Bring on the pumpkin and bring on fall! Gorgeous recipe too! LOVE that you used ricotta cheese in this! 🙂 Looks amazing! Oh my gosh, that looks amazing. I had no I idea ricotta has less calories/carbs than cream cheese and tbh, I prefer the texture ricotta gives cheesecake better than cream cheese. This would make an awesome addition to a holiday menu! I am so happy pumpkin season is here! Ive gotta make this cheesecake this season! 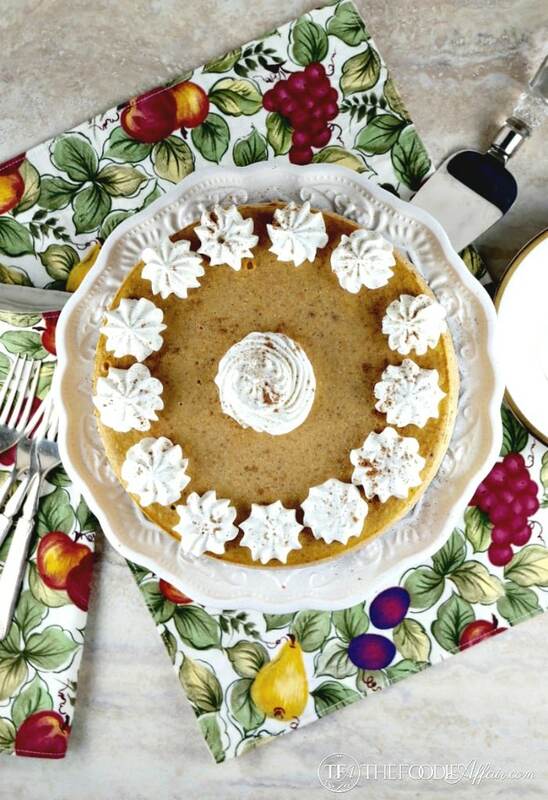 What a gorgeous fall dessert Sandra! I love how you lighten up recipes without losing flavor! Pinning to try later. Have a lovely day! Thank you, Hadia! The pumpkin spices are so flavorful. It’s hard to tell that this is a healthier version of the traditional cheesecake! This is such a pretty dessert! Pumpkins have already started appearing here! I LOVE Pumpkin anything! These cheesecake sounds fabulous…Pinned!! Great recipe. I am on a low carb diet but can’t cut out the dessert, that would be wrong. That looks amazing for any time of year! Gah! I was so excited to try this recipe, but it is still jiggly after almost 2 hours at 300°F! What do I do?! Made this cheesecake for Thanksgiving and it was a big hit! I didn’t have ricotta cheese, so I subbed the same amount of a combo of marscapone and cream cheese and it worked just fine. The only tweak it might need is the sweetener. This cheesecake is on the lightly sweet end, which I personally like. 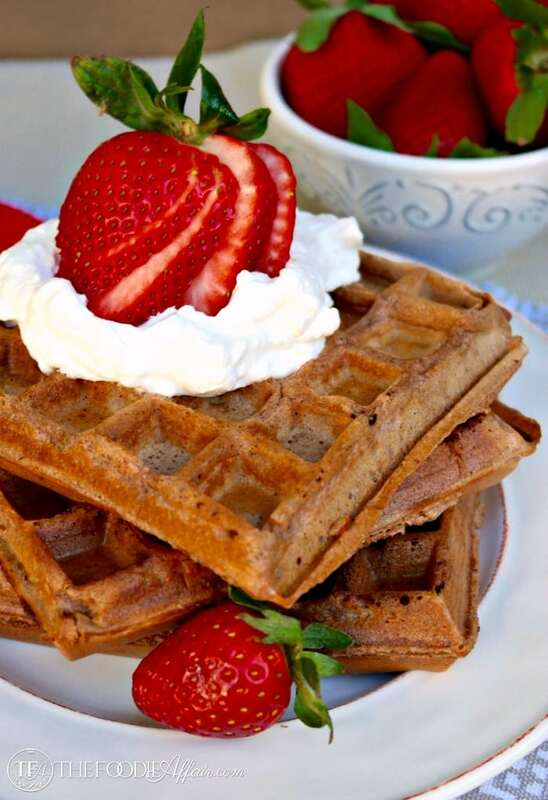 If you want something a little sweeter, then add some extra swerve or def use some sweetened whipped cream. I can’t wait to make this for my family for Christmas! 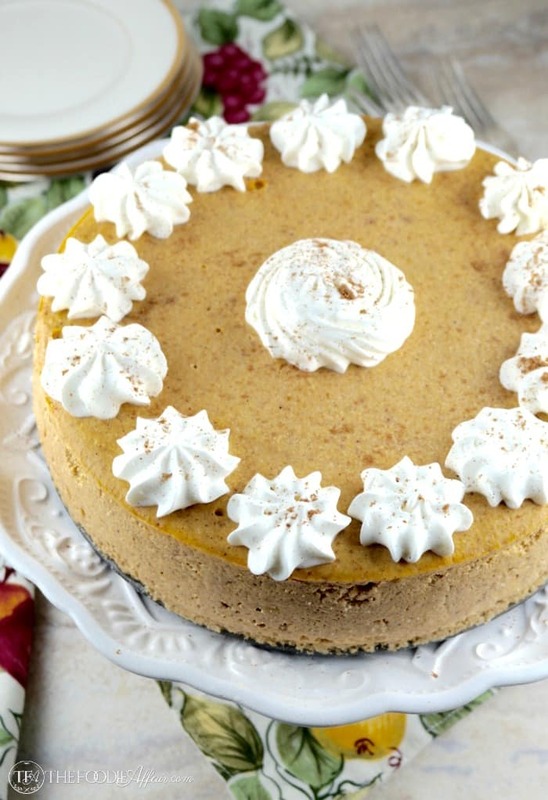 I’m so glad this cheesecake will make another appearance during the holidays! Yes, feel free to adjust the sweetener to your preference!